Asda Cookstown hosts a bear-y exciting picnic for Pudsey! Organisers with families who attending the Teddy Bear's Picnic in Castlecaulfield. Asda Cookstown Community Champion Janice Gibson hosted a Teddy Bear’s Picnic in aid of BBC Children in Need on Saturday, July 7. 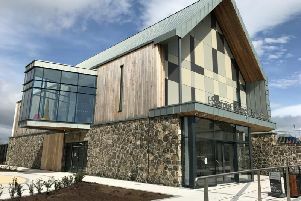 The event was held at the Sports Pavilion in Castlecaulfield Village. Belle of Mid-Ulster Emma O'Neill with Ruth Graham and daughter Jessica. There were lots of ‘bear-y’ exciting activities for the local community to enjoy at the fundraising event, from teddy bear bingo to a traditional tombola plus much, much more. Following BBC Children in Need’s record-breaking £60.7million fundraising campaign in 2017, Asda is partnering with the charity once again to host Teddy Bear’s Picnics across the UK this July to raise funds and support over 30,000 disadvantaged children in local communities across the UK. Janice Gibson, Community Champion explained: “I was delighted to host the Teddy’s Bear’s Picnic for BBC Children in Need – it was a fantastic day and it was great to raise awareness and funds for this worthy cause! “Asda has been a partner of BBC Children in Need for 18 years, and we’re delighted to do our bit here in Cookstown to support the cause. Graham and Brannigan family members with Asda Community Champion Janice Gibson. “The picnic was the perfect way to kick-start our celebrations and we’re so pleased so many people turned up to join in the fun! A large crowd both young and old joined in the celebrations including the Belle of Mid-Ulster Emma O’Neill. Asda would like to give a huge thanks to everyone who supported the event, volunteered their time or who simply came along and made a donation to such a worthwhile cause. Together they all made the day so special. Pictured (Top): Organisers with families who attending the Teddy Bear’s Picnic in Castlecaulfield. (Middle) Graham and Brannigan family members with Asda Community Champion Janice Gibson. (Right) Belle of Mid-Ulster Emma O’Neill with Ruth Graham and daughter Jessica. (Bottom) Twins Harry and Sam pictured at the Teddy Bear’s Picnic.